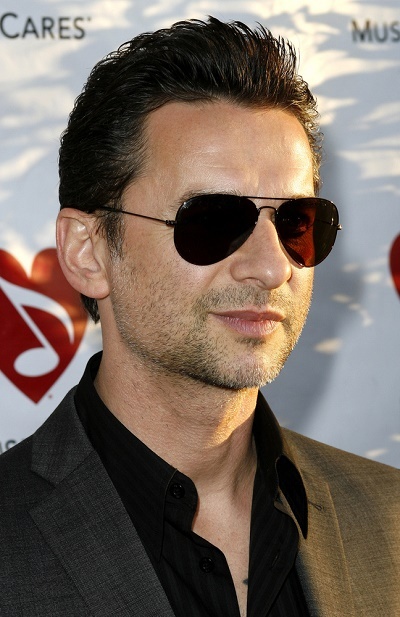 Place of Birth: Romford, Essex, England, U.K.
Dave Gahan is an English singer and songwriter. He is the vocalist of English band Depeche Mode. Martin Gore is also a member of the band. Dave is the son of Sylvia Ruth (Bayliss) and Leonard William Frederick “Len” Callcott. Gahan is his stepfather’s surname. Dave was raised thinking that his mother’s second husband, Jack Gahan, was his biological father. Dave is married to Jennifer Sklias. He has two children, including one with Jennifer. Dave is a convert to the Greek Orthodox religion. Dave’s paternal grandfather was Hugh Leonard Hope Callcott (the son of John Joseph Henry Hope Callcott and Grace Fredrica Lee). Hugh was born in Strait Settlement, Singapore. John was born in India, the son of John Hope Callcott and Mary. Grace was born in Gampola, British Ceylon (now Sri Lanka), the daughter of Charles Lee and Mary. Dave’s paternal grandmother was named Winifred M. Wilson. Hugh was the son of John Joseph Henry Hope Callcott and Grace Fredrica Lee. John was born in India, the son of John Hope Callcott and Mary. Grace was born in Gampola, British Ceylon (now Sri Lanka), the daughter of Charles Lee and Mary. so are his ancestors nothing more than British? His father’s second middle name is Frederick. His paternal grandparents were Hugh Leonard Hope Callcott and Winifred M. Wilson. Hugh was born in Strait Settlement, Singapore.